"Cane (walking stick)" redirects here. For use as a mobility aid, see Assistive cane. For the insects, see Phasmatodea. A walking stick is a device used to facilitate walking, for fashion, or for defensive reasons. Walking sticks come in many shapes and sizes and can be sought by collectors. Some kinds of walking sticks may be used by people with disabilities as a crutch. The walking stick has also historically been known to be used as a defensive or offensive weapon and may conceal a knife or sword as in a swordstick. Walking sticks, also known as trekking poles, pilgrim's staffs, hiking poles, or hiking sticks, are used by hikers for a wide variety of purposes: to clear spider webs or part thick bushes or grass obscuring the trail; as a support when going uphill or a brake when going downhill; as a balance point when crossing streams, swamps, or other rough terrain; to feel for obstacles in the path; to test mud and puddles for depth; to enhance the cadence of striding, and as a defence against wild animals. Also known as an alpenstock, from its origins in mountaineering in the Alps, such a walking stick is equipped with a steel point and a hook or pick on top. A walking stick can be improvised from nearby felled wood. More ornate sticks are made for avid hikers and often adorned with small trinkets or medallions depicting "conquered" territory. Wood walking sticks are used for outdoor sports, healthy upper body exercise, and even club, department, and family memorials. They can be individually handcrafted from a number of woods and may be personalised in many ways for the owner. A collector of walking sticks is termed a rabologist. And the nice conduct of a clouded cane. Some canes had specially weighted metalwork. Other types of wood, such as hickory, are equally suitable. The most common accessory, before or after purchase or manufacture, is a hand strap, to prevent loss of the stick should the hand release its grip. These are often threaded through a hole drilled into the stick rather than tied around. A clip-on frame or similar device can be used to stand a stick against the top of a table. In cold climates, a metallic cleat may be added to the foot of the cane. This dramatically increases traction on ice. The device is usually designed so it can be easily flipped to the side to prevent damage to indoor flooring. Different handles are available to match grips of varying sizes. Rubber ferrules give extra traction on most surfaces. Nordic walking (ski walking) poles are extremely popular in Europe. Walking with two poles in the correct length radically reduces the stress to the knees, hips and back. These special poles come with straps resembling a fingerless glove, durable metal tips for off-road and removable rubber tips for pavement and other hard surfaces. Orthodox protodeacon holding a walking stick. Portrait by Ilya Repin, 1877 (Tretyakov Gallery, Moscow). Various staffs of office derived from walking sticks or staffs are used by both western and eastern Christian churches. In Islam the walking stick ('Asa) is considered a sunnah and Muslims are encouraged to carry one. The imam traditionally delivers the Khutbah while leaning on a stick. Ashplant – an Irish walking stick made from the ash tree. Blackthorn – an Irish walking stick, or shillelagh, made from the blackthorn (Prunus spinosa). Devil's walking stick – Made from Hercules plant. Shooting stick – It can fold out into a single-legged seat. Supplejack – Made from a tropical American vine, also serves as a cane. Penang lawyer – Made from Licuala. After the bark was removed with only a piece of glass, the stick was straightened by fire and polished. The fictional Dr. Mortimer owned one of these in The Hound of the Baskervilles. So did Fitzroy Simpson, the main suspect in "The Adventure of Silver Blaze" (1892), whose lead weighted stick was initially assumed to be the murder weapon. Makila (or makhila) – Basque walking stick or staff, usually made from medlar wood. It often features a gold or silver foot and handle, which may conceal a steel blade. The Makila's elaborate engravings are actually carved into the living wood, then allowed to heal before harvesting. Kebbie – a rough Scottish walking stick, similar to an Irish shillelagh, with a hooked head. Whangee – Asian, made of bamboo, also a riding crop. Such a stick was owned by Charlie Chaplin's character The Tramp. Malacca – Malay stick made of rattan palms. Pike Staff – Pointed at the end for slippery surfaces. Waddy – Australian Aboriginal walking stick or war club, about one metre in length, sometimes with a stone head affixed with string and beeswax. Ziegenhainer – Knotty German stick, made from European cornel, also used as a melee weapon by a duellist's second. The spiral groove caused by a parasitic vine was often imitated by its maker if not present. In North America, a walking cane is a walking stick with a curved top much like a shepherd's staff, but shorter. Thus, although they are called "canes", they are usually made of material heavier than cane, such as wood or metal. In the United States, presidents have often carried canes and received them as gifts. 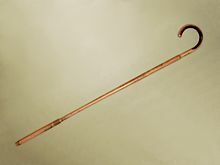 The Smithsonian has a cane given to George Washington by Benjamin Franklin. It features a gold handle in the shape of a Phrygian cap. In modern times, walking sticks are usually only seen with formal attire. Retractable canes that reveal such properties as hidden compartments, pool sticks, or blades are popular among collectors. Handles have been made from many substances, both natural and manmade. Carved and decorated canes have turned the functional into the fantastic. An unidentified woman holding a "tippling cane" or "cane flask" in Washington, DC., 1922. The idea of a fancy cane as a fashion accessory to go with top hat and tails has been popularized in many song-and-dance acts, especially by Fred Astaire in several of his films and songs such as Top Hat, White Tie and Tails and Puttin' On the Ritz, where he exhorts "Come, let's mix where Rockefellers walk with sticks or umbrellas in their mitts." He danced with a cane frequently. Some canes, known as "tippling canes" or "tipplers", have hollowed-out compartments near the top where flasks or vials of alcohol could be hidden and sprung out on demand. When used as a mobility or stability aid, canes are generally used in the hand opposite the injury or weakness. This may appear counter-intuitive, but this allows the cane to be used for stability in a way that lets the user shift much of their weight onto the cane and away from their weaker side as they walk. Personal preference, or a need to hold the cane in their dominant hand, means some cane users choose to hold the cane on their injured side. In the U.S. Congress in 1856, Charles Sumner of Massachusetts criticized Stephen A. Douglas of Illinois and Andrew Butler of South Carolina for the Kansas–Nebraska Act. When a relative of Andrew Butler, Preston Brooks, heard of it, he felt that Sumner's behavior demanded retaliation, and beat him senseless on the floor of the Senate with a gutta-percha walking cane. Although this event is commonly known as "the caning of Senator Charles Sumner", it was not a caning in the normal (especially British) sense of formal corporal punishment with a much more flexible and usually thinner rattan. ^ "ANTIQUE WALKING STICKS - British Pathé". Britishpathe.com. Retrieved 2013-10-07. ^ Norris, Herbert. Church Vestments: Their Origin and Development. p. 116. Retrieved 10 October 2010. ^ The Caning of Senator Charles Sumner at United States Senate history page. Wikimedia Commons has media related to Canes.